TrimTech™ solutions are designed to offer well-crafted headrests, armrests, bolsters and closure panel assemblies. 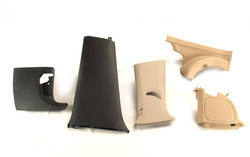 Woodbridge offers complete solutions including: Trimmed Foam, Foam-In-Place and Integral Skin products, as well as engineering and design, trim cover development, pre-production sampling and mass production. Supreme Treon (formerly Known as Supreme-Treves) | Products | Interior: Trim & Acoustic. 1 Overhead/Headliner Module. 2 Dash Inner Insulation. 3 Door Panel. 4 Floor Module. 5 Floor Insulation. 6 Parcel Shelf/Luggage Cover. 7 Trunk/Boot Side Trim. 8 Trunk Floor. 1 Overhead/Headliner Module. 2 Dash Inner Insulation. TrimTech™ solutions are designed to offer well crafted headrests, armrests, bolsters and closure panel assemblies. - Our range of interior trims products improves passenger comfort, providing acoustic performance and an attractive ambience. - These comprise of parcel tray (top and bottom) and roof liner aesthetic fabrics. We are offering our client an excellent quality range of Bus Interior Trims-Brown. We have variety of models available. All this kind of luggage rack can be used directly in any bus and coach. Length of the rack, brackets position can easily moved and removed according to customer's requirement which will be suitable for transportation, packing and installation. Being a quality centric organization, we are providing our clients Interior Felt Trim. These are manufactured by making use of premium quality raw-materials under the supervision of skilled professionals. The offered products are tested by quality experts on different stages in order to meet pre-defined quality parameters. We are offering our client an excellent quality range of Bus Interior Trims- Grey. We have variety of models available. All this kind of luggage rack can be used directly in any bus and coach. 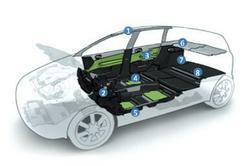 - Varroc, today, puts together all of the major interior components for a seamless interior experience. - Varroc ensure to create visually and technically stunning finishes on components, often covered in luxurious leather, vinyl or cloth, and with or without stitching, to visually coordinate the garnishes within the entire interior. Varroc, today, puts together all of the major interior components for a seamless interior experience. Varroc ensure to create visually and technically stunning finishes on components, often covered in luxurious leather, vinyl or cloth, and with or without stitching, to visually coordinate the garnishes within the entire interior.